To hear John Schneider and Pete Carroll talk, the Seahawks loved all their draft picks, but they really, really like Texas punter Michael Dickson. The Seahawks drafted seven players on the third day of the NFL draft. Here they are. 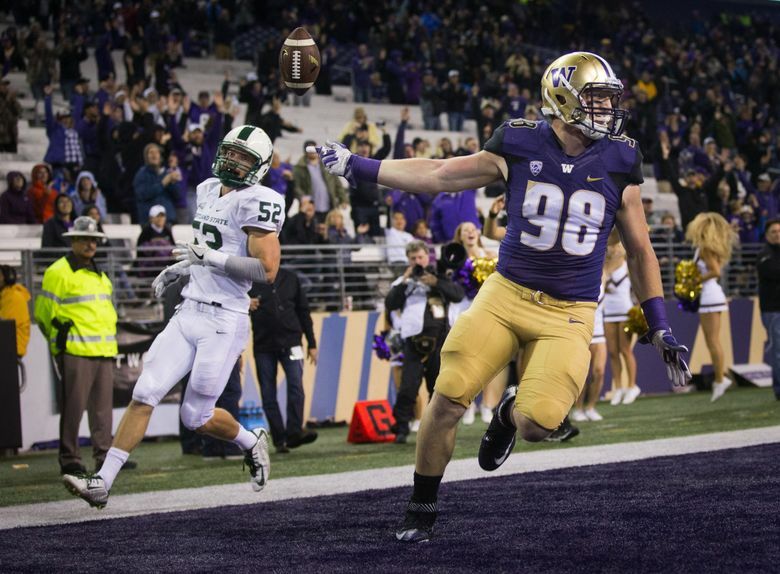 Scouting report: Dissly began his career at Washington as a defensive end before beginning a move to tight end late in the 2015 season and moving there permanently in 2016. He caught 21 passes or 289 yards and two touchdowns as a senior in 2017. Analysis: The Seahawks view Dissly as mostly playing the Y position, or in-line tight end, to start out, adding some needed blocking to an offensive front that was sorely lacking in that department in 2017. But Seattle will also try to work Dissly into the passing game, too. Dissly has a good opportunity to make the 53-man roster with only Ed Dickson and Nick Vannett as experienced tight ends ahead of him. The only other tight end on the roster who has played in a game is Tyrone Swoopes, who played in one game as a rookie last season. 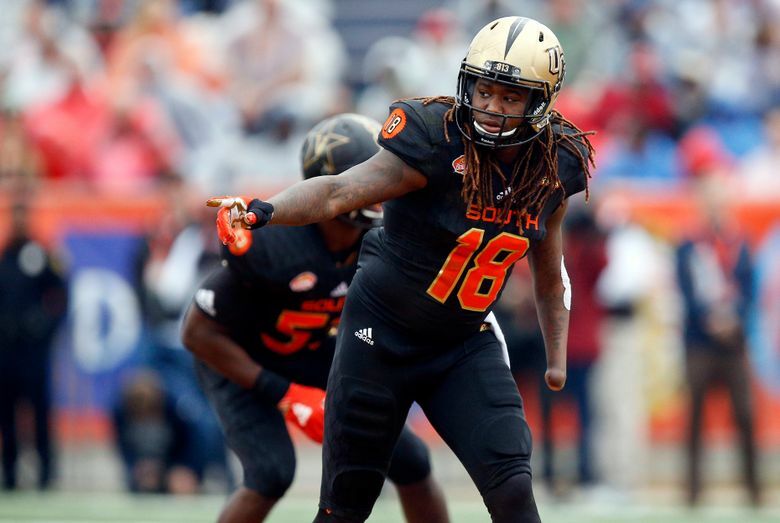 Scouting report: The twin brother of current Seattle cornerback Shaquill Griffin, Shaquem Griffin went from regarded as potentially being undrafted to rocketing up draft boards after standout performances at the Senior Bowl and then the NFL Combine, where he ran a 4.38 40. Was the American Athletic Conference Defensive Player of the Year as a senior playing largely as an outside linebacker. Analysis: The Seahawks say Griffin will start out at weakside linebacker, the spot that has been manned by K.J. Wright the last four seasons. Wright would be hard to beat out in 2018 but he is entering the final year of his contract and turns 29 in July. Griffin also could find his way onto the field in sub packages and undoubtedly on special teams. Scouting report: Playing safety for the Cowboys, Flowers was a first team All-Big 12 pick as a senior, leading the team with 79 tackles, two interceptions and eight pass breakups. 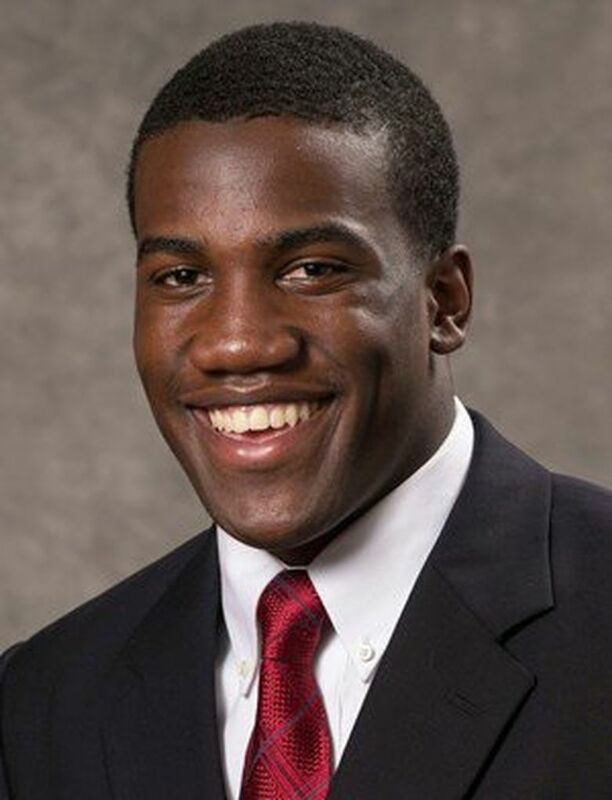 Flowers’ uncle, Erik Flowers, was a defensive end and a first round draft pick by the Buffalo Bills in 2000. Analysis: While he played safety at Oklahoma State, the Seahawks plan to try him first at cornerback. If he can make that transition he not only would add above average height for the position but also the kind of arm length that has always been favored by Seattle for its corners – he measured at 33-7/8-inches at the NFL Combine. Flowers said he played “a little bit’’ of cornerback in high school and college. Scouting report: A native of Sydney, Australia, Dickson played Australian Rules Football for about 10 yeas until, he said, he “didn’t quite make the cut’’ and at the advice of some friends decided to take up punting. 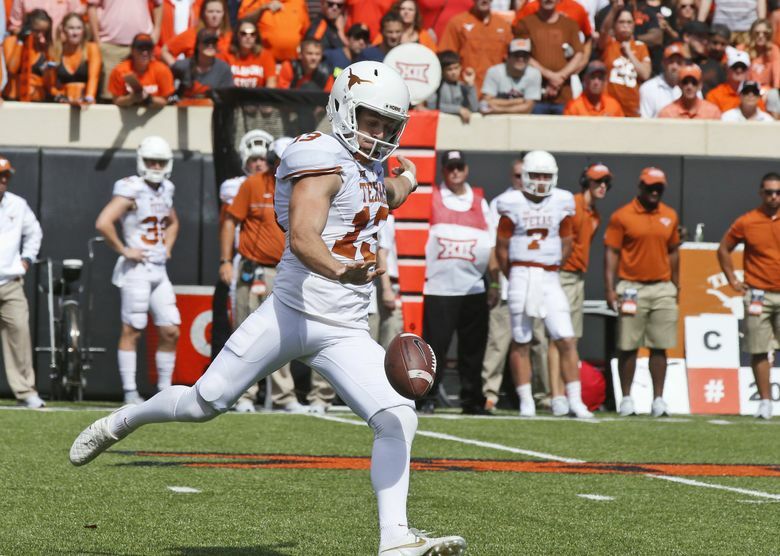 That led to an eventual scholarship to Texas where he won the Ray Guy Award last season as the best punter in college football and then decided to declar early for the NFL Draft. Analysis: NFL teams don’t keep two punters, so the Seahawks are obviously bringing in Dickson to replace veteran Jon Ryan, who is 36 and has significant salary cap hits the next two seasons — Seattle could save $5 million over the next two years if Ryan is released. Dickson averaged 47.4 yards per punt as a senior and dropped a whopping 42 of his 84 punts inside the 20. That includes 10 of 11 in the Texas Bowl against Purdue, which earned him MVP honors. 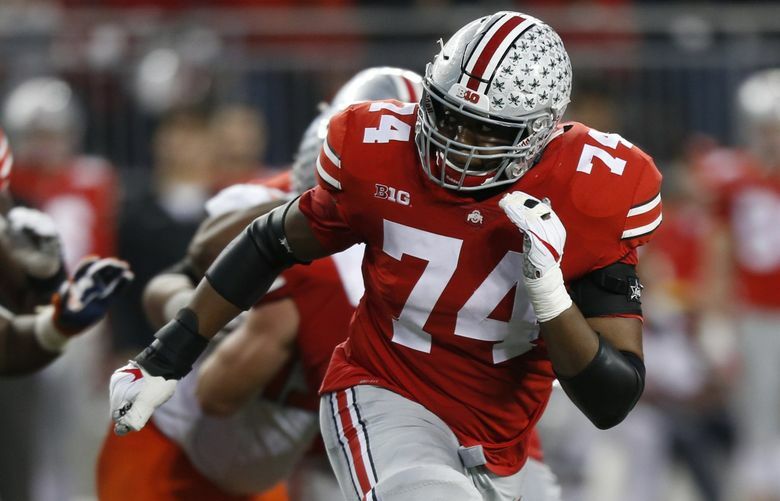 Scouting report: Jones started his final 27 games at Ohio State at left tackle and was an All-Big Ten selection as a senior. But while he was initially regarded as potentially sneaking into the third round, a bad performance at the Combine dropped his stock. Analysis: The Seahawks say Jones will start out at left tackle, backing up veteran Duane Brown. While Brown will be the starter, his contract expires at the end of the 2018 season and he said recently he has yet to talk to the team about an extension and Jones might give the team options depending on how he progresses. Jones playing left tackle appears to mean George Fant will go to right tackle and compete with Germain Ifedi. Scouting report: Martin was a second team All-American Athletic Conference pick in 2017 in what was his first season as a full-time starter, leading the team in sacks with eight in 12 games. He played all over the defensive line for the Owls, who went 7-6 last season. His brother, Josh, is a linebacker with the Jets. Analysis: The Seahawks listed Martin as a LEO, which is the team’s edge rushing position, the spot primarily manned by Cliff Avril the last five years until he was injured early last season. With Avril unlikely to return, the Seahawks need some depth at that spot. And while listed at 236, the Seahawks say he played in the 250s last season and don’t appear to think size will be an issue. 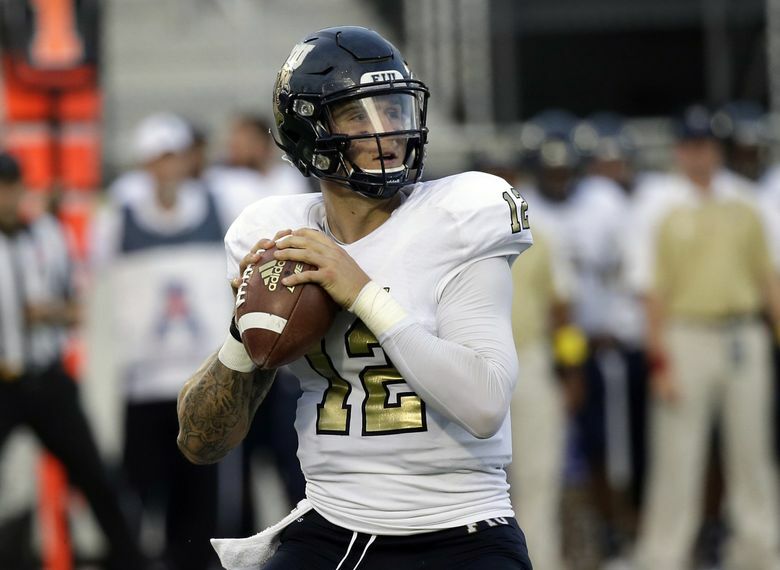 Scouting report: McGough was a four-year starter at FIU, which plays in Conference USA, and completed 807-1335 passes for 9,091 yards, 65 touchdowns and 37 interceptions in his career. He also ran for 535 yards and 16 touchdowns. He suffered a broken collarbone in a 28-3 loss in the Gasparilla Bowl but said it is not an issue now. He had gotten significant interest from Seattle, including taking a pre-draft visit to the VMAC. Analysis: McGough had his best season as a senior in 2017 after former Miami and North Carolina head coach Butch Davis took over and installed a scheme that included more use of spread formations and read zone plays. He responded rushing for 231 yards and five touchdowns, the kind of mobility the Seahawks have said they favor in backup QBs. He’ll compete with veterans Austin Davis and Stephen Morris to back up Wilson.